I have lately been corresponding with Edward Babinski, the author of Leaving the Fold: Testimonies of Former Fundamentalists; he blogs here. Wilson and Gardner had much in common, laid back intellectuals that could both instruct and entertain. Neither was Gardner an atheist. Gardner defended belief in God, prayer, miracles, and free will in The Whys of a Philosophical Scrivener. And like Wilson, Gardner criticized fundamentalist religion. Where they differed was when it came to testing "psychic" or other weird claims. 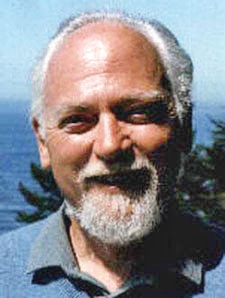 Gardner was skeptical of claims that he thought were based on pseudoscience, including Reich's experiments and hypotheses. Wilson on the other hand, didn't seem to mind if a thousand quacks had their day, because he was confident that in the end the truth will out. Wilson was also a self-experimentalist, dabbling in everything from magic to hallucinogens, mental imagery techniques, and even the latest brain frequency synchronizers. Wilson would have loved to have been invited (as was Shermer of The Skeptic Society), to sit in that recently developed machine that sends massive waves of magnetism into one's temporal lobes and often generates the feeling that one is out of one's body, or that someone is behind you. Gardner was raised in Oral Roberts country and after leaving the fold in college (see The Flight of Peter Fromm, a semi-autobiographical novel Gardner wrote) he was probably repelled by all sorts of hucksterism and gullibile behaviors. Yet as I said Gardner never could give up on the possibility of God, miracles, etc., being true.